A motto or mantra for a school can be used to remind both children and parents of their goals throughout the year. A good motto will provide a catchy phrase that sums up an idea students and teachers can rally behind. Kids in this group are likely ages K-6th grade, so you will want to keep concepts simple, but not babyish. Focus on attitude and perspective. Everyone from that 5-year-old kindergartener to the 11 or 12 year old sixth grader will have to find the saying relevant and relatable. Be Smart. Be kind. Be courageous. Come together for a better world. Excellent attitudes at all times. Serving all for a greater community. Perform, learn, excel for a better tomorrow. I can do it if I put my mind to it! Every student counts, every moment matters. Families supporting teachers supporting students. Working harder to be smarter. We are all part of a learning family. Bringing my best every day. Dream big and work hard. Beaming talents for a brighter tomorrow. Control your attitude and adjust your future. Be safe. Be respectful. Be smart. In order to get students to remember and implement your motto, you will need to remind them of it frequently. Some teachers have their students write the motto on every test or assignment. Others repeat it with empowering activities or games. 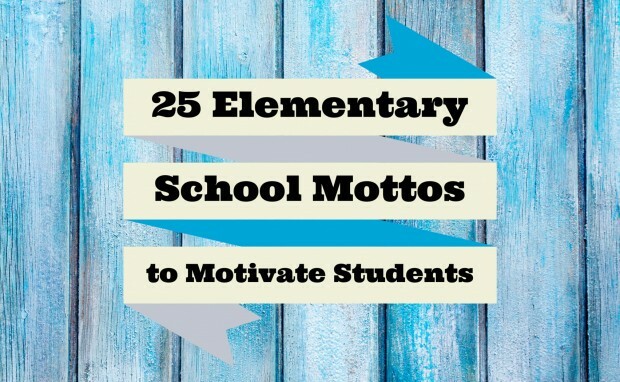 You could print up elementary school t-shirts with the mottos on the back and the school logo on the front for students, teachers and parents. Special t-shirts make a great unifying factor on a field trip, helping identify the group and keep everyone together. Bumper stickers, banners and bulletin board designs are also great ways to remind each students of what he or she should be striving for. 59Fifty Fitted Caps - The Ultimate Caps Customized for Your Team! Copyright 2017. IZA Design Inc.